Randy serves our firm as Chief Operations Officer and has partnered with Jay since 2004 fulfilling various roles. As COO his days are spent managing the daily operations of our firm and our staff; assisting in recruiting, onboarding, and developing new financial advisors; and he partners with all of our existing financial advisors as a business resource to them in recruiting and hiring staff, managing office needs, and personal business planning. Randy is also a Financial Advisor with his Series 7 and 66 and, as such, serves a client base along with Jay and Caleb. Before joining Northwestern Mutual, Randy spent 24 years with BellSouth where he worked in Financial Analysis, Economic Forecasting, and Sales & Marketing. 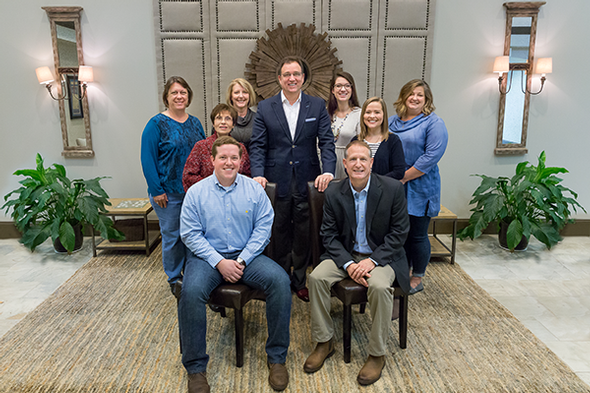 Randy received his MBA from The University of Alabama – Birmingham and his Finance degree from Auburn University. Given his extensive business management experience and his thorough familiarity with all aspects of our operations, feel free to contact him by phone or email with any questions. Katie serves our team as Director of Development. She assists in the areas of recruiting, onboarding, training, and developing new College and Full-Time Financial representatives. She also assists Jay as a Managing Director by coordinating all speaking engagements, including the Leadership Summit 2-day seminar hosted multiple times throughout the year at our office in Hoover, AL. If you have questions about career opportunities with our firm, hiring Jay for a speaking engagement, or attending our Leadership Summit, please contact Katie by phone or email. Staci serves our team as Associate Financial Representative in Client Services. She works with new and existing clients in preparing applications, managing the insurance underwriting process, and servicing existing accounts and policies for ongoing needs. Staci's goal is to make the financial planning language and process something easier and simpler for everyone to understand! If you have questions about opening new accounts or policies, changing your existing accounts or policies, making payments, or accessing your account online, please contact Staci by phone or email. Jen serves our team as the Special Events Coordinator. She organizes and oversees all Hoover Office events such as regular cookouts, holiday parties, and awards celebrations. She also makes sure each individual in our office is recognized for special occasions, celebrations, milestones, awards, or other acknowledgements. She makes sure all of our clients feel valued and appreciated by connecting with them around special celebrations such as birthdays and weddings. Her goal is to work closely with Jay to promote and sustain our firm's nationally-known "family culture." Mary Ann serves our team as one of our Receptionists. She greets and accommodates clients and guests, directs phone calls, and monitors scheduling of conference rooms. She assists in some marketing duties for Jay's clients, helps onboard new staff members, and plays a role in coordinating office events throughout the year such as our Office Cookouts. Mary Ann has had many years of experience on Jay's team and will be a helpful resource for you when you visit our firm! Donna serves our team as one of our Receptionists. She greets our clients, answers the main office number and directs calls, assists in the onboarding process for staff members, as well as many other support functions for the Hoover office. Donna's goal is to help our clients feel welcome. After retiring with a 36 year career in the telecommunications industry as a human resources manager, Donna joined Jay's staff and works part-time.